For those of you who have hung around for a while, MyEtherWallet should not surprise you. However, for those new, it might sound alien. MyEtherWallet (aka MEW) claims to be an offline wallet as it uses a machine’s browser to generate necessary data and nothing is ever stored on MyEtherWallet servers. MEW has its web-based interface as well as a Chrome extension version but for this tutorial we will keep the scope limited to the web version. In its web interface, you can either manage Ether and other tokens directly or manage them via MEW on Ledger Nano S, Trezor, Digital Bitbox or MetaMask. In this tutorial, we will only see how to directly manage your tokens on the web version of MEW directly. Note: In the future, I will append this article with more information on how to use MEW with Trezor or Ledger Nano S like wallets also. How to make an MEW wallet? How to manage (send/receive) Ether on MEW wallet. 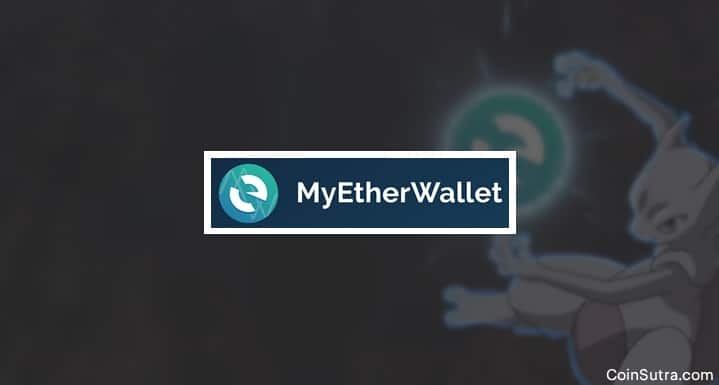 Note: There are many phishing scams around MEW so be careful and bookmark the MEW wallet official link and never forget to check for MYETHERWALLET LCC [US] in the address bar with secure https connection. 3. 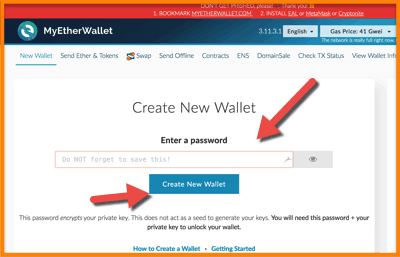 Enter a password that you want to keep for the wallet and click on ‘Create New Wallet’. (Note: This password encrypts your private key. This does not act as a seed to generate your keys. You will need the password entered + your private key to unlock your wallet. 4. 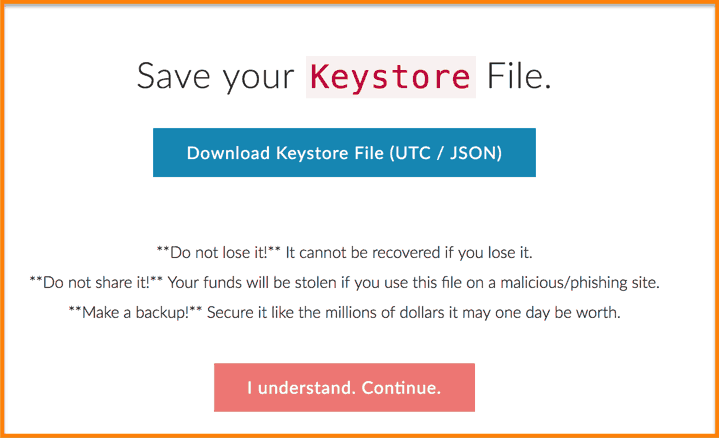 Once you click on ‘Create New Wallet’, you will find an instruction you to download ‘Keystore File’ with several important disclaimers. 5. After reading the instructions, click ‘Download Keystore File’. Once done with that, the ‘Continue’ option will be enabled. 6. The UTC file you see in the above image needs to be saved and secured. Do not change the name or content of the file in any case. Save the file to an offline hard drive or a pen drive which you don’t take online. 7. Click on ‘I understand. Continue‘ to see your private key. 10. You have successfully created a new wallet on MEW to manage your Ether and other tokens. How to manage (Send/Receive) Ether on MEW wallet? 1. Your new MEW account isn’t unlocked instantly. You need to unlock it first to use it. 2. 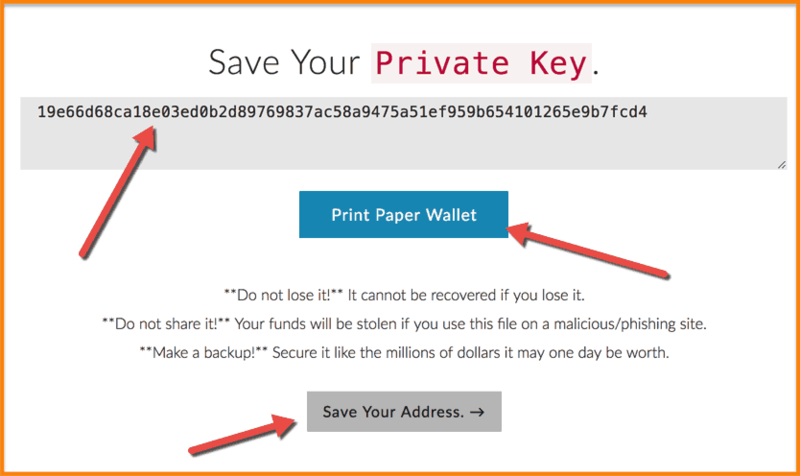 There are several ways of unlocking it but we will stick to the option of unlocking your wallet via the stored ‘Keystore File’ that we downloaded in step #5 in the first section. You will also need your password that you entered in step #2. 3. 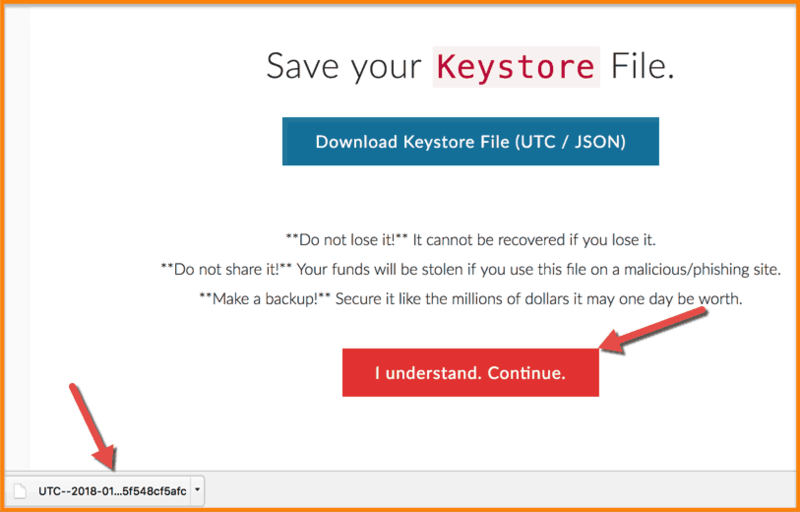 Now, select the ‘Keystore File’ option as shown below. You can access this unlocking menu from the menu bar of MEW via option ‘Ether & Tokens’. 5. Once you have selected the file, you will be prompted to enter the password that you created in step #1. 6. Now, enter your password and unlock your wallet to see this screen. 7. 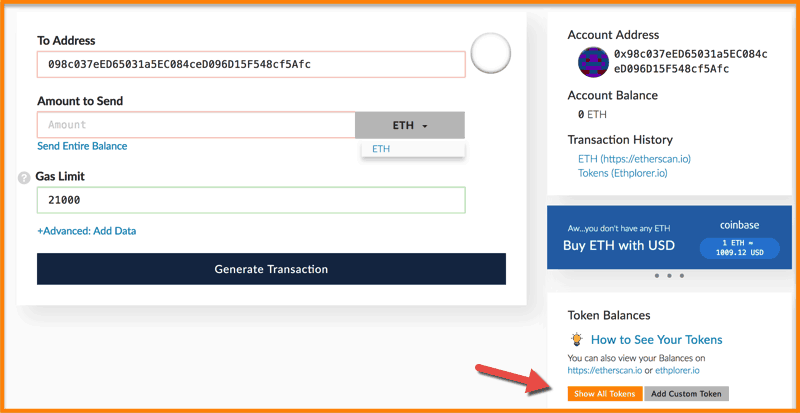 As you can see in the image above, the MEW wallet is open and you can see your account address to receive ETH or tokens on it. Use the ‘To Address’ to put ETH address of the recipient and ‘Amount To Send’ field. This way you can access your MEW and send/receive ETH and other tokens. How to manage ERC20 tokens on MEW? Managing ERC20 tokens on MEW wallet is as easy as ETH itself. 1. Once you have unlocked MEW, click on ‘Show All Tokens’ option as shown in this image. 2. Once you click on ‘Show All Tokens’, you will see a list of all the MEW supported tokens. 3. 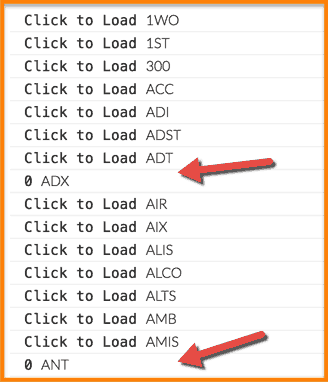 Now, click on any token to load and enable it in MEW. It will then reflect the balance of those tokens in MEW. 5. This way you will be able to manage your ERC20 tokens easily in MEW. You ETH address and token address for ERC20 tokens will be the same unless you make different accounts. It is recommended that you make only one account and manage everything using that. 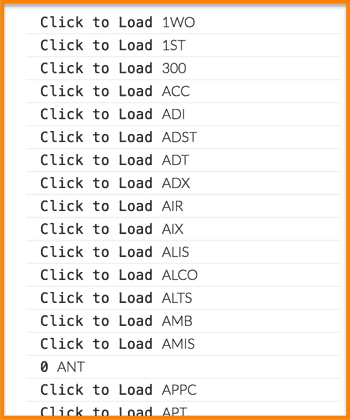 Also, while sending ERC20 out of MEW, make sure you select the right token from the drop-down menu in ‘Amount to send’ field. For example, if you are sending PAY tokens, you need to select PAY in the drop-down. If you are sending OMG, select OMG in the drop-down, and so on. Also, select the right Gas Price and Gas Limit while sending ETH or tokens out of the MEW failing which your transactions will not be completed. Use this guide to know more about the concept of Gas limit and Gas price. That is all from my side. I hope you liked the tutorial on getting started with MyEtherWallet and also how to send/receive ETH/tokens through it. Please feel free to drop a comment or questions if any. Let us keep learning and sharing the crypto revolution with Coinsutra. If you like the post, please share it on Twitter and Facebook! 1 How to make an MEW wallet? 1.1 How to manage (Send/Receive) Ether on MEW wallet? 2 How to manage ERC20 tokens on MEW? Nice guide Sudhir, but there’s one question on my mind. 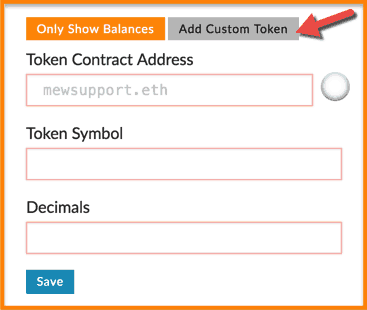 To add a token using the custom token option in MEW, a token must be ERC20, if a token is not ERC20, I will not be able to add it, right? Therefore, its important to learn that a token is ERC20 before we add it. I think you can mention it under the custom tokens heading. Just a suggestion. Informative anyway. So I can only store ethereum in mew? What about btc and ltc? The advice, you to pick from these https://coinsutra.com/types-of-crypto-wallets/ but however, I use Ledger Nano S for all three.